The Ocoee has also been touted as America’s #1 Whitewater River and only Olympic River. Commercial river outfitters offer expert guides to help you capture the excitement of the Class III and Class IV rapids. Divided into sections, the Middle Ocoee has been used for commercial rafting since 1976, when the flume line was shut down for rebuilding. Once the flume line work was completed it was too late to stop the whitewater enthusiasts. The Upper Ocoee was developed for use as the whitewater venue during the 1996 Olympic Games. This effort required the riverbed to be reshaped to provide the required hydraulic action to ensure world class rapids. Today, over 250,000 visitors a year get their thrills going down the Ocoee, so plan your trip to Ocoee Country today. This is an experience you will never forget! 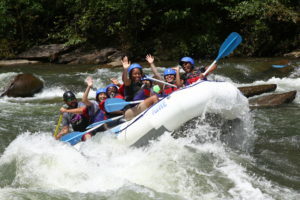 See our whitewater rafting page for a list of outfitters on the Ocoee.